San Diego, CA: Following the success of Oxford Dictionary & Translator on Android, with over 1 million downloads in three months, MobiSystems has now launched the app on iOS. 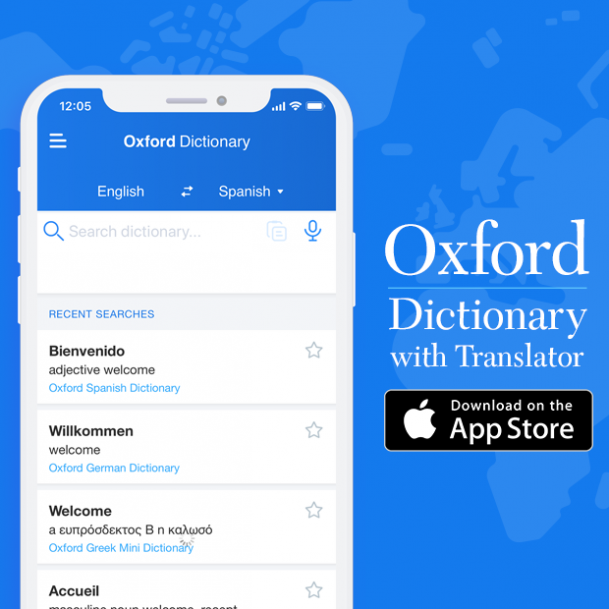 iPhone and iPad users will have 14 best-selling Oxford bilingual dictionaries, featuring 4.5 million words and definitions at their disposal. With an integrated Translator, this enormous linguistic database is a solid reference tool for any language inquiries. Oxford Dictionary & Translator is an all-in-one translation tool that offers advanced search options and learning features. The app can translate phrases and entire paragraphs, and also provides audio search and audio pronunciations. It can also work in offline mode and translate between English and any of the supported 14 languages. Dynamic switch between Dictionary and Translator delivers fast translations of words or paragraphs. Thanks to the Fuzzy filter (that finds even misspelled words) and the Wildcard filter (which searches for words with several letters, replaced with a “*” or “?”) users can lookup words they do not know how to spell. The app also offers lists of Favorite translations and supports a Copy/Paste function of words and paragraphs copied from other apps. The Android version has also been updated to offer new features like Word of the day and can now also translate words and paragraphs directly from other apps such as web browsers or Facebook. The iOS version is also scheduled to receive these functionalities and more in the near future. Oxford Dictionary & Translator is a result of a long-lasting partnership between MobiSystems and Oxford University Press (OUP). In 15 years of cooperation, over 50 Oxford dictionaries have been published in digital format for different mobile platforms like PDA, Palm OS, Pocket PC, Android and iOS. Currently, more than 20 million mobile users enjoy dictionary titles by OUP and MobiSystems. Dictionaries included: Oxford Dictionary of English, New Oxford American Dictionary, Oxford Russian Dictionary, Oxford Spanish Dictionary, Oxford Chinese Dictionary, Oxford Hachette French Dictionary, Oxford German Dictionary, Oxford Japanese Mini Dictionary, Oxford English Urdu Dictionary, Oxford Paravia Italian Dictionary, Oxford Essential Portuguese Dictionary, Concise Oxford-River Books English-Thai Dictionary, Oxford SoftPress English Bulgarian Dictionary and the Oxford Greek Mini Dictionary. Availability: For more information on Oxford Dictionary & Translator, please visit the product page on the App Store. With origins dating back to 1478, Oxford University Press (OUP) is the largest university press in the world, and the second-oldest it is a department of the University of Oxford. It furthers the University's objective of excellence in research, scholarship, and education by publishing worldwide. As one of the leaders in the office application and business productivity and reference marketplace, with over 300 million lifetime installs across over 200 countries, MobiSystems has been producing professional, top-level products since 2001. Along with the Oxford Dictionary of English, the company also develops other industry-leading products such as OfficeSuite, File Commander File Manager, and AquaMail to name a few.